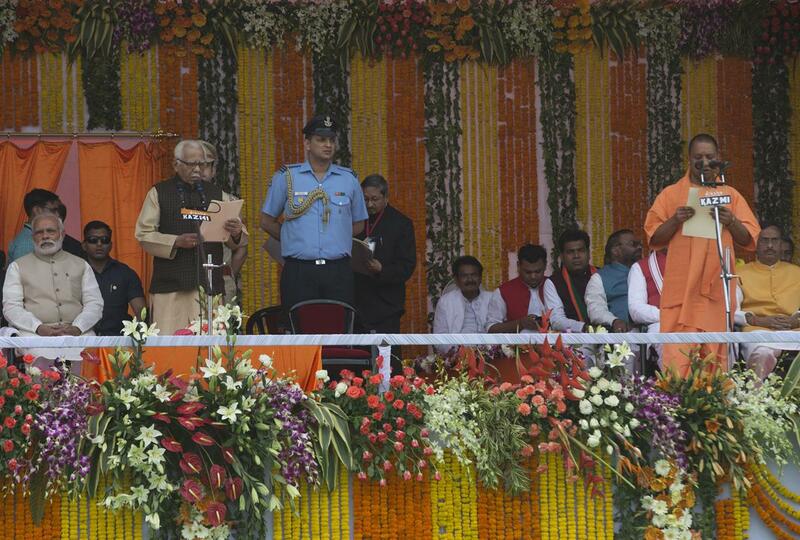 A hard-line Hindu religious leader was sworn in Sunday as the chief minister of India's most populous state. 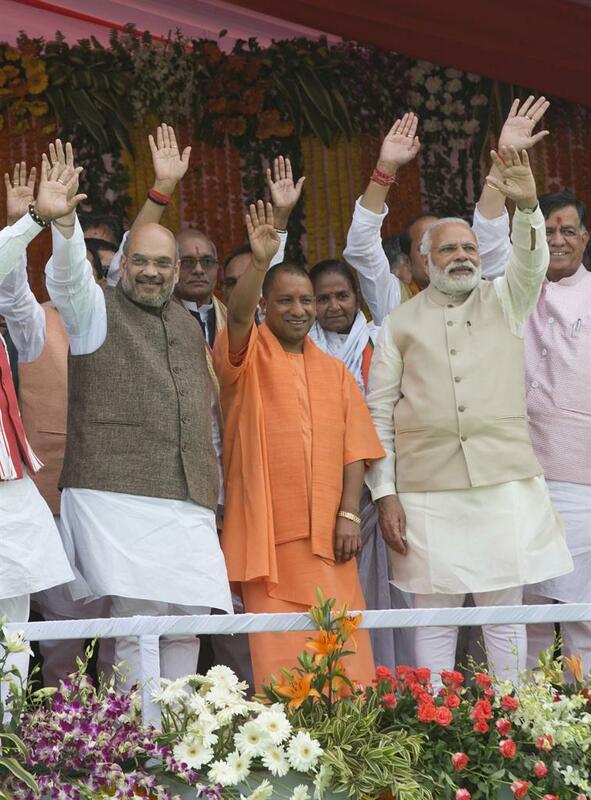 Prime Minister Narendra Modi and other leaders of India's ruling party attended a ceremony in the Uttar Pradesh state capital of Lucknow, where Yogi Adityanath took the oath of office. The 44-year-old Adityanath has won the parliamentary seat from Gorakhpur district in Uttar Pradesh since 1998. He is also the head priest of a temple in Gorakhpur. Two deputy chief ministers and 47 other ministers were also sworn in at the ceremony, which came a week after the ruling Bharatiya Janata Party won a landslide victory in state assembly elections. 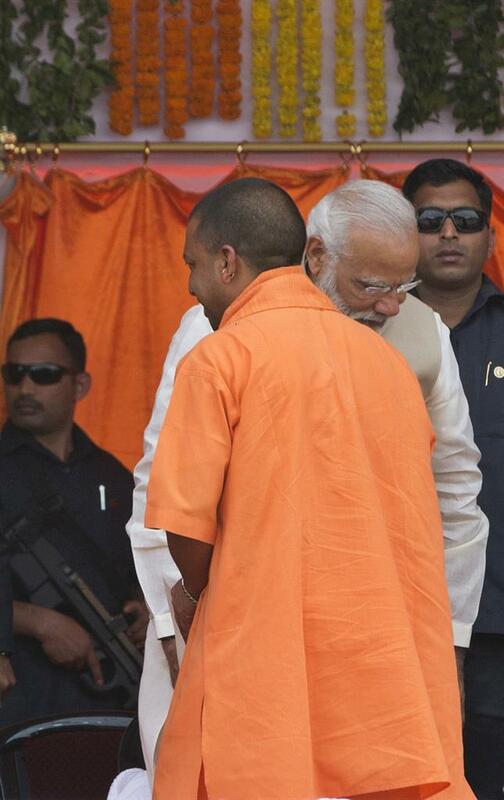 On Sunday, Adityanath tried to reassure Uttar Pradesh citizens that his top priorities were good governance and development of the state, among the poorest in India. 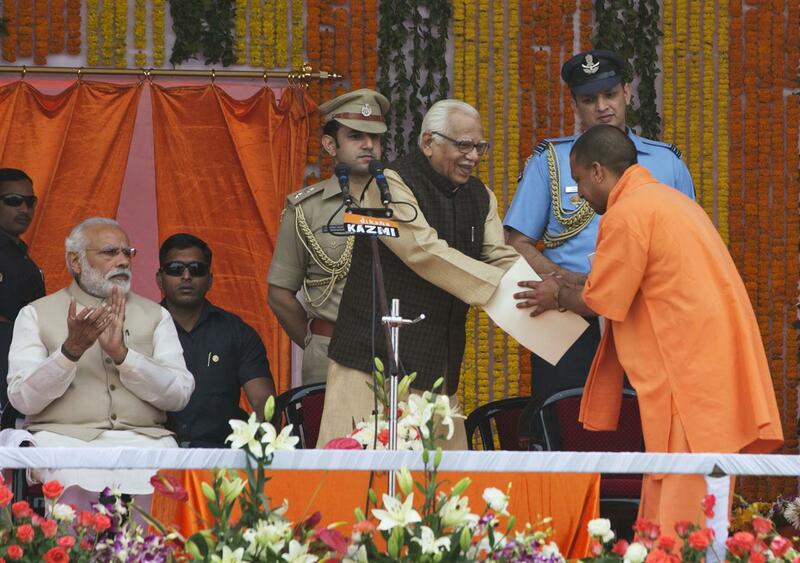 Indian Prime Minister Narendra Modi, left, watches as Yogi Adityanath, standing right greets Governor Ram Naik, after taking oath as Uttar Pradesh state chief minister in Lucknow, India, Sunday, March 19, 2017. Security men guard behind Indian Prime Minister Narendra Modi, middle, during the swearing in of Yogi Adityanath, back to camera as Uttar Pradesh state chief minister in Lucknow, India, Sunday, March 19, 2017. 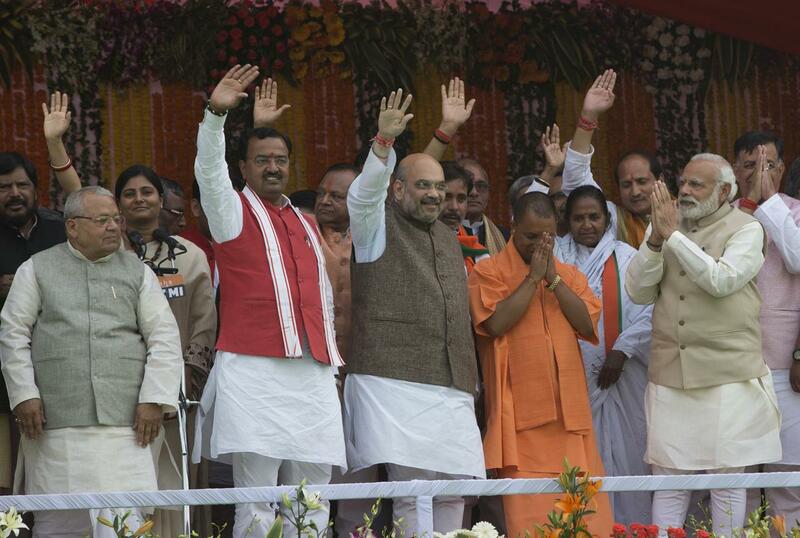 Indian Prime Minister Narendra Modi, second right, Yogi Adityanath, center in saffron robes, and Bharatiya Janata Party president Amit Shah, left and others wave to the audience after Adityanath was sworn in as Uttar Pradesh state chief minister in Lucknow, India, Sunday, March 19, 2017. Indian Prime Minister Narendra Modi, second right and Yogi Adityanath, in saffron robes, greet with folded hands as Bharatiya Janata Party president Amit Shah, center and others wave to the audience after Adityanath was sworn in as Uttar Pradesh state chief minister in Lucknow, India, Sunday, March 19, 2017.